Could there be a more perfect spring cake? 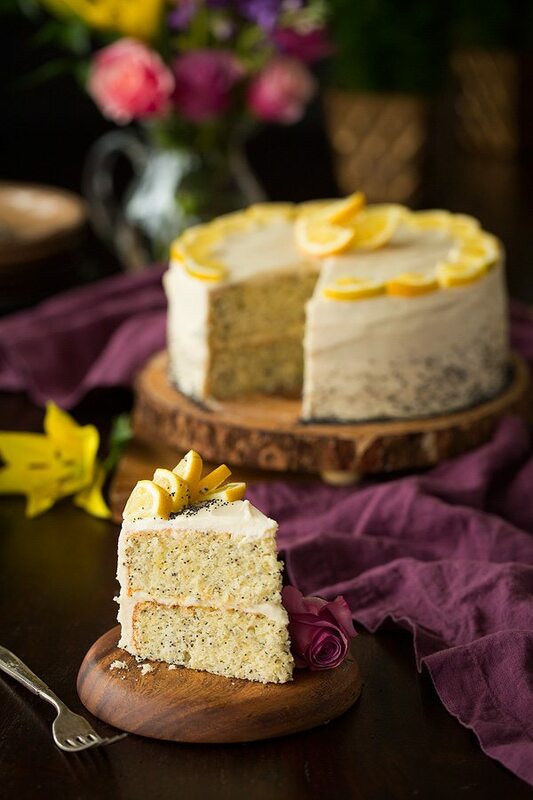 This brightly flavored Lemon Poppy Seed Cake with Cream Cheese Frosting is just what I need to end a long cold winter and bounce right into the new season (don’t get me wrong I love all four seasons but by the end of each one I’m ready for the next). This cake has got to be one of my favorites! I love lemon everything. It’s just one of those flavors that you don’t have to question, and it balances out the sweetness in any dessert perfectly. 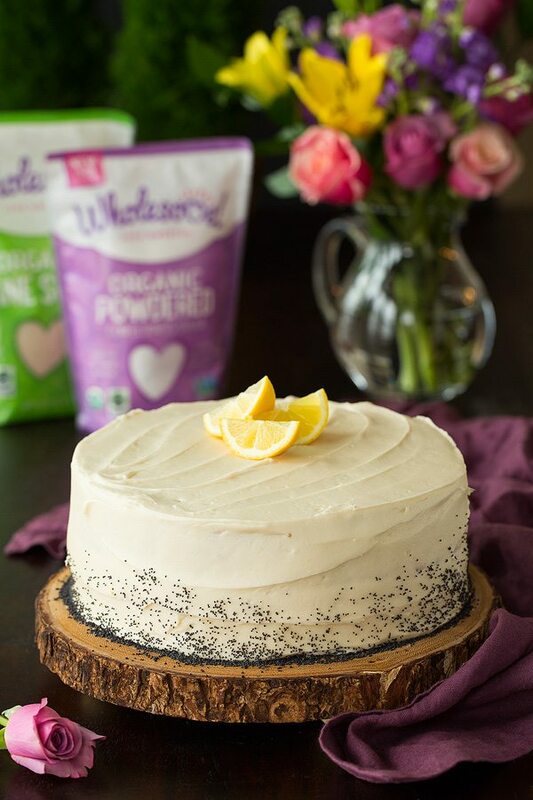 And then when you add those faintly crunchy little flecks of poppy seeds to the mix for a light flavor and textural contrast, and top each layer of the cake with a rich cream cheese frosting you know it’s a cake that won’t let you down. 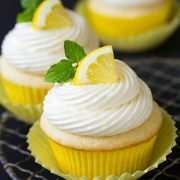 This is a crowd pleasing cake that’s sure to get some praise, people will be swooning over each soft and fluffy, sweet lemony bite! The two sugars I used in this recipe are the Wholesome Organic Cane Sugar and Wholesome Organic Powdered Sugar. 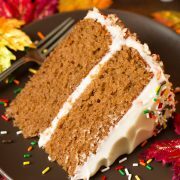 The cane sugar is a good replacement for white sugar for things like baking cakes and cookies (or to sweeten just about anything). The powdered sugar is perfect for frostings. I’m slowly working on adding more organic foods into my families diet (I just made the jump to organic milk a few months ago), so I love knowing there’s now organic sweeteners that are more easily accessible for everyone. You can find many of these products at nationwide grocery stores now. 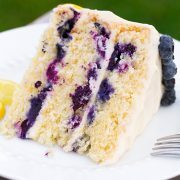 Try them in this lemon cake and see for yourself the great end result you’ll get! 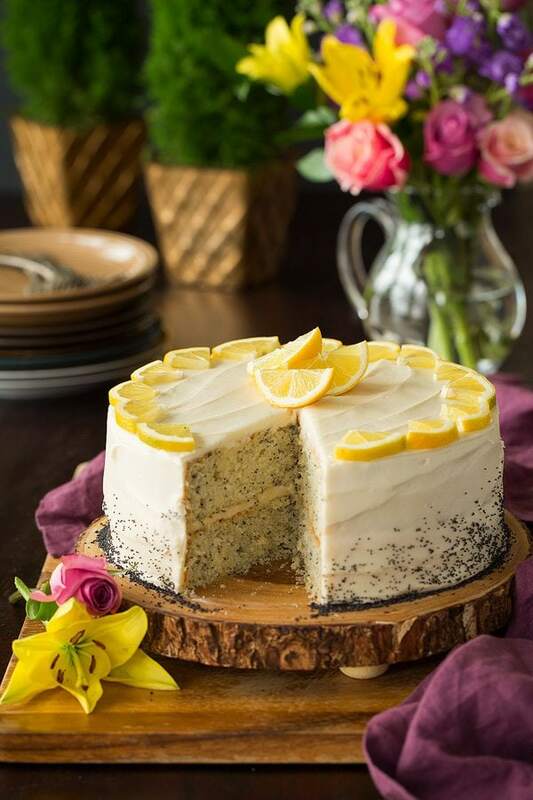 Want to see how to make lemon poppy seed cake? Watch the video! Preheat the oven to 350 degrees F and prep the cake pans. Cream together butter, sugar and lemon zest until pale and fluffy. Mix in canola oil and eggs, then add in the lemon and vanilla extracts. In a liquid measuring cup, mix together the buttermilk and lemon juice. Add the flour mixture and the buttermilk mixture to the butter/sugar mixture. Divide cake batter between the prepared cake pans and bake until a toothpick inserted in the middle comes out clean. Remove cakes from oven. While they’re still warm, brush with simple syrup. Add in vanilla extract and powdered sugar and mix until fluffy. Freeze in 3-minute increments as needed until frosting is desired consistency. Can I Omit the Lemon Extract if I Don’t Have Any? I wouldn’t recommend that. 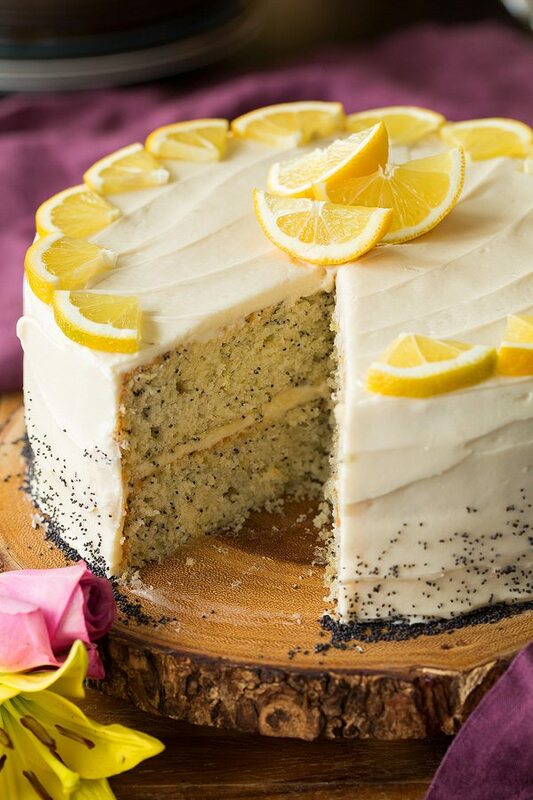 The lemon extract really makes this lemon poppy seed cake — without it, I’m not sure the lemon flavor would be strong enough. Can I Use a Buttermilk Substitute, if Needed? Without having tested it, I can’t say for sure if a buttermilk substitute would work. But I think a mixture of whole milk and lemon juice could be substituted in a pinch. For best results, measure in grams using a kitchen scale. If you don’t have one, lightly fluff bag of flour then scoop into a measuring cup and sweep top with a knife to level. About halfway through cooling the baked lemon cakes, I recommend transferring them to an airtight container to seal in their moisture. Let the cake layers cool completely before adding the homemade cream cheese frosting. Otherwise, the frosting will melt! 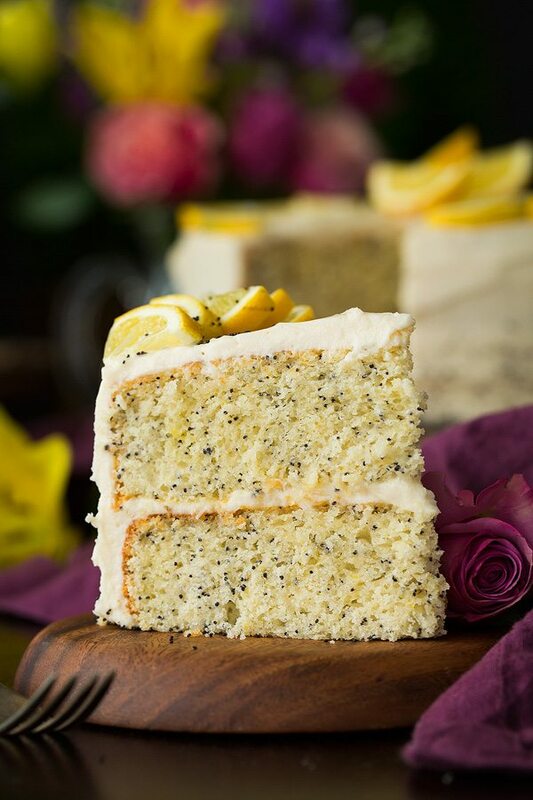 The best lemon poppy seed cake! Two moist, fluffy, lemony layers of poppy seed swirled cake are each covered with a layer of decadent cream cheese frosting. In other words, you'll be savoring every crumb! Preheat oven to 350 degrees. Butter two 9-inch round cake pans then line with a round of parchment paper. Butter parchment paper, lightly dust pans with cake flour and shake out excess, set pans aside. Sift cake flour into a large mixing bowl. Add baking powder, baking soda, salt and poppy seeds and whisk 20 seconds, set aside. 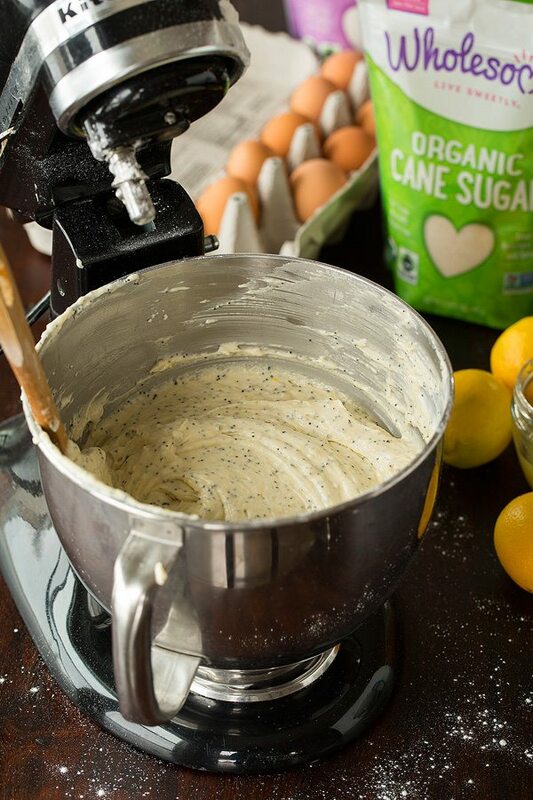 In the bowl of an electric stand mixer fitted with the paddle attachment cream together butter, cane sugar and lemon zest until mixture becomes very pale and fluffy. Mix in canola oil then blend in eggs one at a time, mixing just until combined after each addition. Mix in lemon extract and vanilla extract. In a liquid measuring cup mix together buttermilk with lemon juice. Add 1/3 of the flour mixture to the butter/sugar mixture. Mix on low speed just until combined. Add in 1/2 of the buttermilk mixture and mix just until combined. Add another 1/3 of the flour mixture and mix just until combined. Mix in remaining 1/2 of the buttermilk mixture and finish by mixing in the last 1/3 of the flour mixture. Scrape sides and bottom with a spatula and gently fold until batter is evenly incorporated. Divide batter among two prepared cake pans. Spread into an even layer. Bake in preheated oven until toothpick inserted into center of cake comes out clean, about 30 - 34 minutes. Remove from oven let cool in pan 5 minutes then run a knife around edges of cake to loosen and invert cakes onto wire racks. While cakes are still warm, using a pastry brush, brush cakes with simple syrup. About halfway through cooling I recommend transfer cakes to an airtight container to seal in moisture. Let cakes cool completely then frost with cream cheese frosting. For the simple syrup: In a small saucepan set over medium-low heat whisk together lemon juice and can sugar until sugar has dissolved. For the cream cheese frosting: In the bowl of an electric stand mixer fitted with the paddle attachment cream together butter and cream cheese until smooth. Add in vanilla extract and powdered sugar and mix until light and fluffy. Freeze in 3 minute increments as needed, stirring between increments until frosting is desired consistency. *For best results, measure in grams using a kitchen scale. If you don't have one, lightly fluff bag of flour then scoop into a measuring cup and sweep top with a knife to level. The cake came out really soft and fluffy, and smelled and tasted great! I substituted the lemon extract with another tsp of fresh lemon juice and used the rind of 2 lemons instead of 4. Afra Taidin: I kid you not. This recipe is fullproof! Super soft, not too sweet and just yumm. I subs the cheese with a lemon fresh whipped cream. Why i said its good? Because Ive tried so many recipe, and this one is the fluffiest.